Internet search engine Google has reaped the rewards of a rapid growth in search advertising with a near six-fold surge in quarterly earnings. Google reported a net income of $369.2m (£282.7m), or $1.29 a share, in the first quarter, compared with $64m, or 24 cents a share a year ago. The figures eclipsed even the most optimistic of Wall Street forecasts. 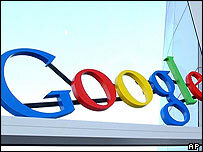 Shares in Google rallied by more than $5 after the closing bell on Thursday to trade at $214 a share. This is more than twice Google's float price of $85 a share in August last year. Total revenue was $1.26bn (£960m), almost double last year's $651.6m figure. The key to the company's rapid profits growth has been the surge in revenue from adverts that are triggered when internet users type certain key words into Google's search engine. Google gets paid each time one of the adverts displaying a link is clicked on. "This was a very strong quarter for Google," said chief executive Eric Schmidt. "We continue to execute well and we have been able to take full advantage of the growth in online advertising." Commenting on the figures, Chris Baggini of the Gartmore Growth Fund said: "On the surface they look fantastic." Wall Street estimates had put Google's quarterly earnings at 92 cents a share.